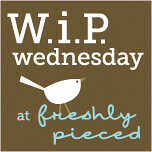 I'm so excited to finally be participating in WIP Wednesday! I've been admiring everyone's updates for a while now and I finally got it together to make my own update. 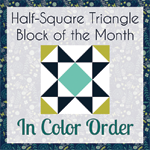 Jeni's Warm Cool Quilt Along immediately grabbed my attention! I absolutely adore her and her blog (plus little bunny foo foo, George, is adorable!). I've apparently gone crazy and committed to the twin size. I have a thing for quilts I can snuggle under...especially since the hubs pumps the a/c at 72 degrees! Yikes! I've trimmed about 120 of the 352 blocks. Yeah, don't remind me. Here's my other project, the LouLouThi Tiles Quilt Along from Stitched in Color. 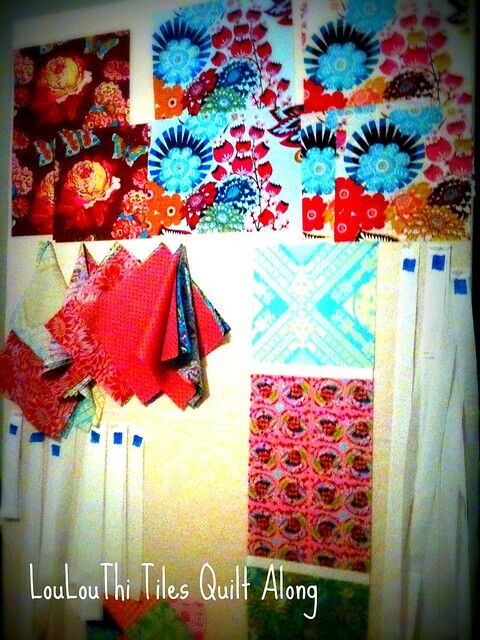 I cut out and labelled all my pieces, and stuck them up on my new design wall. (More on the wall another day.) I've been giving this one some attention, in between sewing, ironing, and trimming blocks for the Warm/Cool. It gives me a nice break. This one will definitely be a monster....almost queen size! I can't wait to see both of those. I want to do the Loulouthi tiles one too (although the smaller size) and the warm/cool one has my attention as well. We'll see. Too many ideas not enough time! LouLouThi Tiles is going to be so bright and fun! There's something so satisfying about seeing a pile of trimmings beside our blocks--so glad you included that photo in your post today. The Loulouthi looks terrific, and it also looks like you're having a lot of fun playing with the fabric (isn't that what really counts?). Lou Lou Thi Tiles looks like you have picked some pretty fabrics..and the w/c QAL you have been busy trimming them HST's eh? good job. 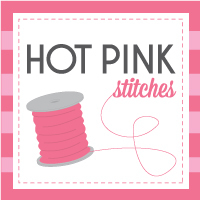 I am positively drooling over your fabric stack of HSTs. Yummy! i wish my husband pumped the a/c at 72! Ours is set at a sweltering 80 - my quilts sit at a distance from me, just looking pretty and begging to be used until about october! that warm/cool QAL is so tempting. i want to see more of your stack of HST's! I have been loving seeing all the photos of the warm/cool quilts - it's a great design! You are using beautiful fabrics and colours, it looks like fun. I too have so many projects it is hard to keep track right now. Yours are looking nice and the colors are wonderful. 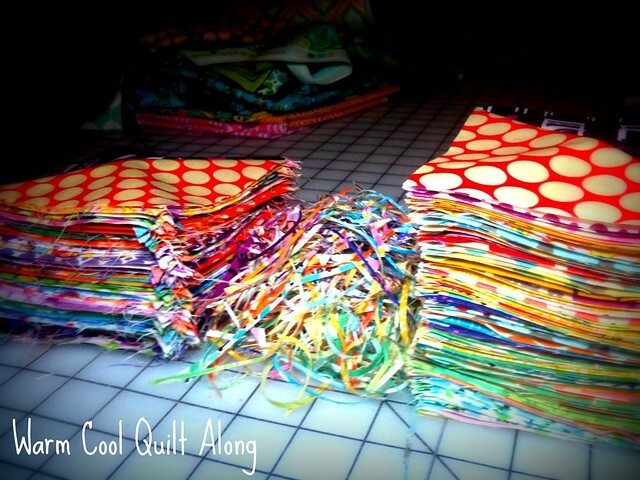 I don't get in near as much quilting as I would like. 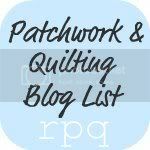 I have a quilt I want to start as well as a table runner....maybe this week? Oops, sorry, the above comment is from me - apparently I was signed in as my husband! LOL.